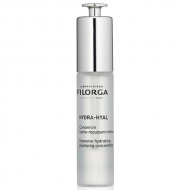 DESCRIPTION: Nutri-Filler Crème Nutri-Reconstituante by Filorga is a nourishing care. Formulated with the NCTF complex, Hyaluronic acid, and enriched with Shea Butter, Argan Oil and Red Seaweed extracts, it nourishes and fills the skin while fighting skin relaxation and redrawing the oval of the face. Instantly, the skin regains nourishment and comfort. Day by day, the skin becomes denser and and the oval redefined. Apply morning and evening after the serum.